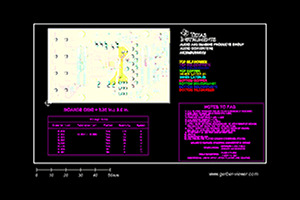 This reference design is an active pass-band filter connected to the analog-to-digital converter (ADC) in a C2000™ microcontroller (MCU). The system senses ripple and noise on the power rail in the band of interest. The Fast-Fourier Transformation (FFT) algorithm analyzes harmonic content of the signal and allows for switching frequency detection. 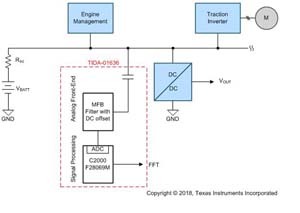 The analysis enables for adaptive real-time switching frequency dithering in high-power applications and better electromagnetic compatibility interference (EMI) control. Alternatively, ripple counters in feedback-less positioners can benefit the design. Digital Signal Processing (DSP) features of C2000™ microcontrollers play an important role in the system and enable digital-power (on-board chargers, DC-DC converters) and motor control (traction inverters) applications to become smarter and more efficient.